Few things amp up the ambiance of a room quite like a fireplace. Whether you’re outfitting a living room, building lobby, or any space in between, they can all benefit from the warmth and glow that fireplaces offer. In today’s post, we’re outlining the benefits of choosing an electric fireplace over traditional and gas options. While traditional fireplaces are great, they often require a lot of maintenance and aren’t suitable for many locations. They can also wreak havoc on our health and on the environment. Combustible sources contain toxic carbon monoxide, smog-causing nitrogen oxides, soot, fine particles, and a range of other chemicals and gases that can cause or worsen serious health problems, particularly among children, pregnant women, and people with breathing difficulties. Gas fireplaces are another option, but they are generally expensive to run (propane isn’t cheap! ), and you don’t get the snap, pops, and crackles of a real fire (essentials in our opinion!). 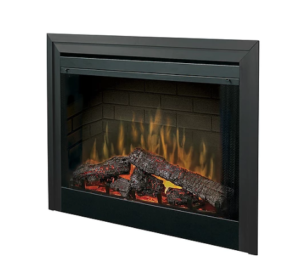 Enter the electric fireplace, specifically Dimplex electric fireplaces. Dimplex products are like the Cadillac of electric fireplaces, and they have all of the pros of traditional and gas fireplaces without the cons. Let’s take a look at the benefits of a Dimplex electric fireplace. Dimplex electric fireplaces use cutting edge technology to offer you the most realistic flame- you’ll swear you have a real fire going! Both the look and sound simulate a real fire, so you can enjoy the true experience of a fireplace. Between traditional, gas, and electric, electric fireplaces are the easiest to install. You don’t need a chimney or a gas line- they’re just like any electrical appliance that you can plug in anywhere! If you can “install” a toaster, you can install an electric fireplace. An electric fireplace can save you money on your heating bill and is generally much cheaper to run than a gas fireplace. Not only are you getting the look and feel of a real fireplace, but you’re also saving money! They are also generally cheaper to purchase and install than gas fireplaces. With an electric fireplace, you control the flame and the heat separately- if you want to really warm up a room you can turn both the flame and the heat on; if you don’t need the heat, simply enjoy the flame on its own. Unlike traditional and gas options, electric fireplaces emit no carbon monozide, particulates, or emissions. Also, with the growth of wind and solar you could essentially heat your space and have all the benefits of a fireplace through 100% renewable energy! The glass front of an electrical fireplace stays cool to the touch, giving you complete peace of mind. It’s a great option if you have kids or pets running around! All of the ambiance, none of the worry. Which Dimplex electric fireplace is right for your space? If you already have a mantel or want the look of a traditional fireplace, an electric firebox is the option for you. 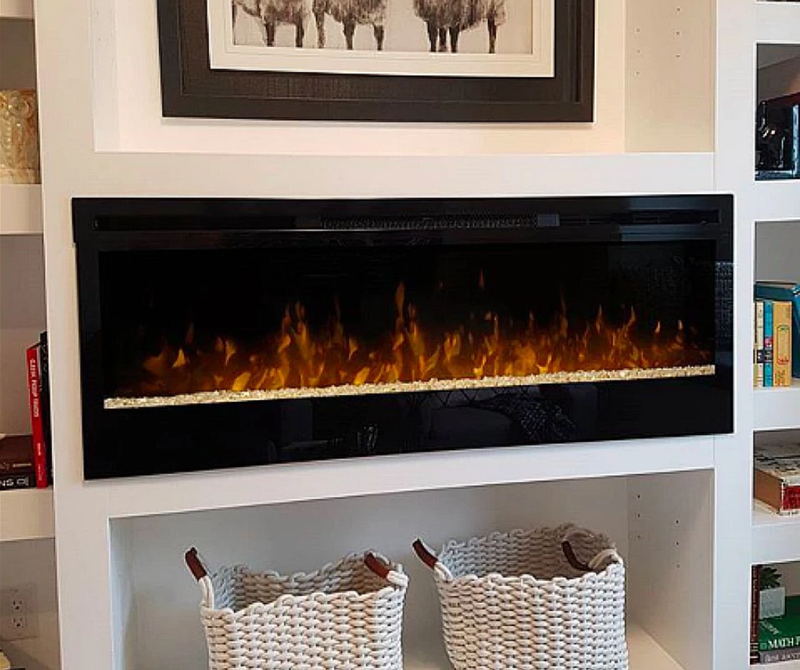 They can be fitted right into your existing mantel, or you can pair them with a Dimplex BuiltRite Mantel to instantly add the look and feel of a real fireplace into your room without any hassle. They come in a variety of sizes, so you can choose the one that’s right for your space. For a sleeker, more modern look, consider a wall mount electric fireplace. Available in a variety of sizes and lengths, they can be outfitted right onto the wall and offer the perfect blend of modern and warmth. All you need is a bracket and an outlet. The bottom line: a Dimplex electric fireplace is a cost efficient and easy way to dramatically enhance the ambiance of your space.